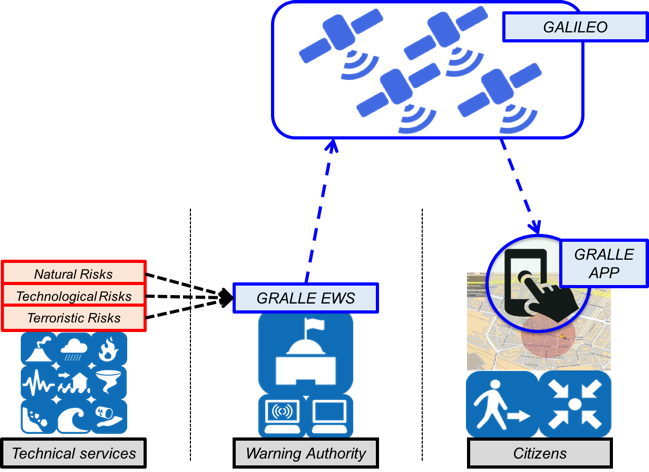 GRALLE (Galileo-based Reliable Automatic and Low Latent Emergency warning service), is a project funded by the European Commission, started in February 2017. 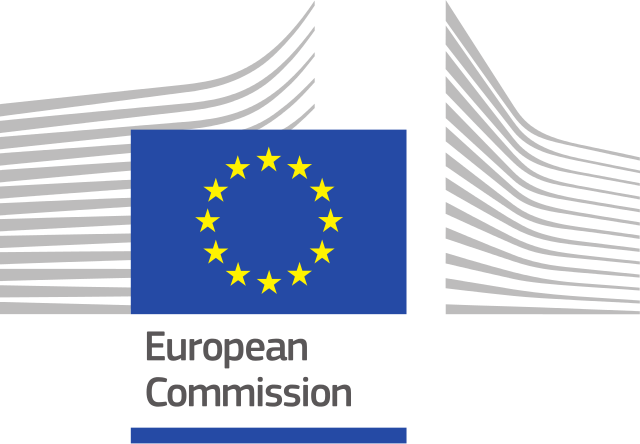 The goal of the project, which will end in December 2018, is to carry out a feasibility study – both technical and in terms of interest from the community of alert message providers – for the realization of a global system for broadcasting alert messages to the population, through the use of the European Galileo satellite system. The fundamental concept underlying the system proposed in GRALLE, which will be called GEWS (Galileo-based Emergency Warning Service), is the availability of a system able to guarantee the distribution of alert messages to the population, even in cases where the means traditional communication and therefore the same Internet network are not available, perhaps as a result of the damage caused by the disastrous event. 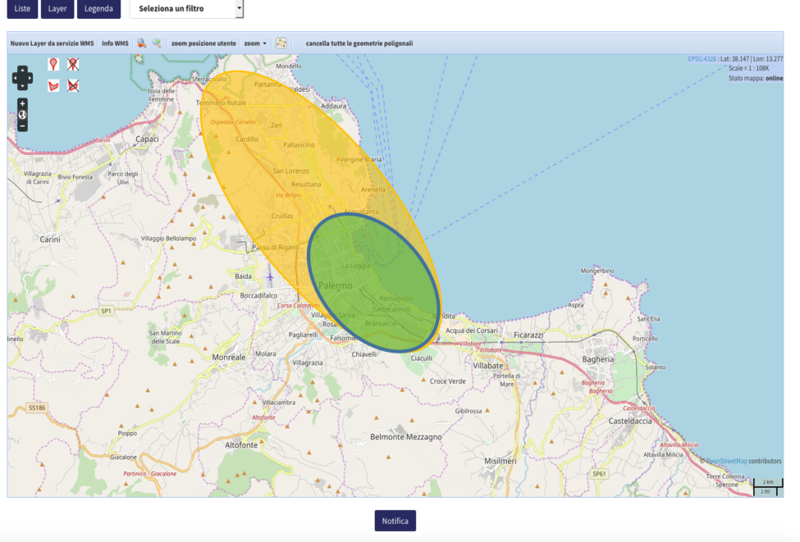 The main actors of the alert system proposed in GRALLE are: the Alert message providers on one side (for example, the Civil Protection in Italy), and the citizens on the other. The Providers will be able to use the equipment and IT systems already in use for the generation and distribution of the alert messages, appropriately adapted for communication with the GEWS distribution system. In this case, the interfacing between the existing systems and the GEWS will take place through the use of the standard CAP protocol. Citizens will receive the alert messages through an APP installed on their mobile devices (smartphones) which, equipped with a GNSS receiver capable of capturing and interpreting the alert messages coming from the Galileo satellites, will be able to recognize if a given message it must be delivered to the user or not based on the geographic location and authority of the institution that distributed it and, if so, display the instructions. The APP will be able to work completely offline, ie without the help of the Internet and no other communication possibilities except for that represented by the reception of messages from the Galileo satellite system. In the GRALLE project, IES Solutions is the leader of the state of the art analysis and the user needs collection tasks. Moreover, it leads the impact analysis, the organisation of the field trials and the dissemination of the GEWS trials’ results. IES also supports the activities dealing with the service concepts definition, design and implementation, and plays the role of standardisation expert, thanks to its active participation to standardisation groups, such as ETSI, CEN and OASIS, and in particular to the ETSI-related standard MAMES (Multiple Alert Message Encapsulation over Satellite). Under this role, IES will ensure that the Galileo-based EWS will be as more compatible as possible with the existing systems and infrastructures. For the trials with Emergency Warning Services Providers, IES will provide its solution Jixel and, specifically: a) the Jixel Manager product, which will be used by Emergency Warnings Providers to show how alerts are generated and how they will be submitted in the real-life to the GEWS; b) the mJixel product, the mobile APP for the end users (citizens) to receive and visualise alerts. The provider generates the alert message, selecting the geographical area (or geographical areas) of interest, and associating the instructions to be addressed to citizens. Different instructions may be defined for different areas of interest (as in the case of the two ellipses of the following figure), depending on the behavior expected by citizens based on the risks highlighted. The GEWS system receives the message sent by the provider, in CAP format and converts it into the binary format to be sent to the satellite system. The GNSS receiver on the user device, decodes the incoming signal from the satellites and generates a message that, through the APP, is delivered to the citizen in his own language, in case the position of the same falls in one of the geographical areas of interest and conditions authorization of the provider on the specific geographical area are met. GRALLE has started on 3 February 2017 with its dedicated kick-off meeting, and will end in the second trimester of 2018.